It looks like we're in a snowglobe right now. Nothing brings on festive feelings better than the rarity that is full-on snowfall. 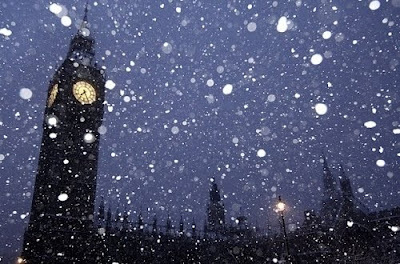 I heart this image, from weheartit - I can see right across the city from my building and London looks so magical covered in white. I had plans to hit Oxford Street tonight to buy my few remaining Christmas presents (all the rest bought, majority of which wrapped - I'm organised and smug about it too) but if it carries on like this I have a date with a snowman. I'm jealous of the smugness. I have done nothing. NOTHING!